I see there is another Great Escape Publishing Ultimate Photography Workshop coming soon. Unfortunately, I can’t fit this one into my incredibly busy schedule; otherwise, I’d be there like a shot. Why attend another one, you might ask, considering I’ve attended other GEP workshops in Spain, Venice, Paris (twice), Istanbul, and Santa Fe, New Mexico? No matter how much you know, there is always something new and exciting to learn. But more than that, they are so much fun and I have met such interesting people over the years. When I retired in 2007 from teaching in international schools around the world, I knew I could never just sit and do nothing. At first, I thought I might try writing and joined one of those content mills where you put up an article and hope it sells. I wasn’t making much, and it was a lot of work for little reward. One day, I came across Great Escape Publishing, and an article on becoming a money-making photographer caught my eye. It looked interesting, and I thought I might like to try it. But I had no idea about the practical aspects of photography, so I realized I would need help. I saw there was going to be a photography workshop in Seville, Spain. I took a deep breath and signed up. It looked fun, and who wouldn’t enjoy a week traveling around Seville and Cordoba taking photos? I was rather nervous as I had only an entry-level DSLR set on manual, and I had no idea how the thing worked. Our teacher was Efrain Padro. I had such a wonderful time, and Efrain was such a great teacher that I learned an enormous amount in just a week. From then on, I was well and truly hooked. This was going to be my future. From that first experience, every workshop I have attended has given me more inspiration and more knowledge about how to produce marketable shots, as well as finding wonderful friends. At one of the GEP Photography Workshops, I was introduced to stock photography; now it’s my main focus. Why did I choose stock? Mainly because I don’t have to do anything about marketing my images—the stock site does all that and pays me each month for the ones I’ve sold. And I get to take shots of anything and everything that catches my eye. Yes, I’m one of those irritating people who are taking pictures of their food in a restaurant, but, hey, my shots, once uploaded for stock, will probably pay for the meal. 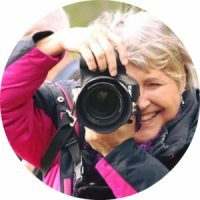 I’m a 75-year-old retired schoolmistress; photography gets me out and about and keeps me active and happily engaged for hours on end. When I was nearing retirement and wondering what I was going to do for the rest of my life, I would never have dreamed that I could be a money-making photographer. It was just that chance encounter online with Great Escape Publishing. I am so glad I took that first step. Try it. You’ll never know where it leads unless you do.